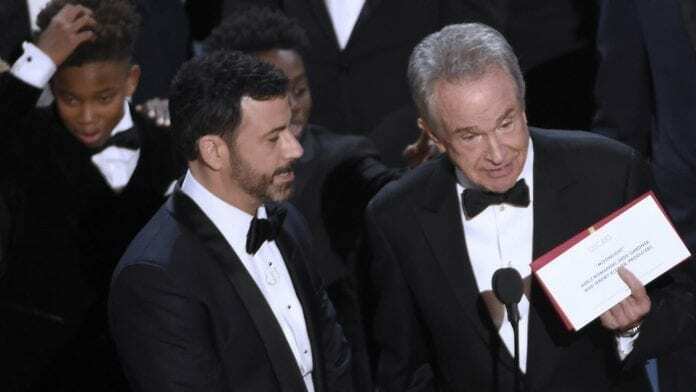 Warren Beatty (right) attempts to explain Oscar mistake as host Jimmy Jimmy Kimmel looks on. The Academy Awards ended on a sour note when Faye Dunaway announced that favorite La La Land had won the Oscar for Best Picture. Trouble is, she and co-presenter Warren Beatty had been handed the wrong envelope. So, while La La’s producers were taking turns delivering heartfelt acceptance speeches, they were abruptly interrupted so that the audience could be informed that Moonlight was the real winner. Immediately, that film’s cast and crew descended upon the stage while the suddenly-deflated La La entourage quietly exited via the wings. Besides Best Picture, Monlight landed awards for Best Supporting Actor (Mahershala Ali) and Adapted Screenplay. La La can take some consolation in the fact that it nabbed the most honors overall, 6, including Best Director (Damien Chazell), Score and Song (“City of Stars”). Otherwise, Hollywood’s biggest night represented a remarkable reversal of its recent lily-white preferences, picking the predominantly-black cast Moonlight as Best Picture, along with African-Americans Viola Davis (Best Supporting Actress), Mahershal Ali (Moonlight), Barry Jenkins (Best Adapted Screenplay) and Ezra Edelman (director of O.J. : Made in America). Edelman, the son of legendary children’s rights attorney, Marian Wright Edelman, dedicated his victory to Ron Goldman and Nicole Brown Simpson as well as to victims of police brutality. His wasn’t the only politicized acceptance speech, with many recipients hurling thinly-veiled barbs at Donald Trump. The most virulent attack on the President came from came from Iranian Ashgar Farhadi, writer and director of Best Foreign Film-winner, The Salesman. He boycotted the festivities, but had a spokesman read a statement excoriating Trump for issuing an executive order temporarily banning travelers from his country and a half-dozen other Muslim countries. Jimmy Kimmel took a lot of indirect potshots at the president, too, like when he asked Meryl Streep whether her gown was from Ivanka’s fashion line. When the O.J. Simpson doc won, he quipped, ” O.J., you can get an extra slice of baloney on your sandwich tonight.” Kimmel was very smooth delivering his funny but never mean-spirited jokes, so don’t be surprised if he’s asked to host again next year, especially given that the Oscars air on ABC, the same network as his late night show.